November is almost over and December is quickly approaching. In most parts of the country the temperature has already dropped and some folks even have snow on the ground. If you have ever visited or lived in Texas than you know the weather can be crazy. Yesterday we were at a sunny 70 degrees and the kids wore shorts to school. Last night our temperature dropped 25 degrees in 2 hours, so right now its a cold 45. Texas weather is unpredictable to say the least. Down right crazy if you ask me. One day it's hot and the next day it's cold. I always say we get two seasons out here summer and winter and nothing in between. Our weather has been so crazy that I still have a few things producing in our summer garden. My tomatoes did awful all summer, but all of a sudden they're really taking off. I have one large tomato plant that's still producing a pretty good amount of tomatoes. Were also in pepper overload. I can't believe the amount of peppers that are still growing. I took the photo above of our cayenne peppers this morning. They're in full bloom and so colorful. The jalapenos and the green bell peppers are still producing as well. Goodness what to do with all those beautiful peppers? If I get enough jalapenos I want to make Jalapeno pepper jelly, but since I didn't have enough I made Hot Pepper Sauce instead. In some parts it's also known as Hot Pepper Vinegar, especially down in the south. You can go to just about any barbecue joint, fried chicken or cat fish restaurant and find a bottle of pepper sauce. I have seen them many of times gracing the tables at Cracker Barrel. It never dawned on my to try and make it myself. Well, not until I saw the recipe in my Paula Deen Newsletter. The recipe wasn't exact, so I did the best I could. I used a variety of peppers that I had growing in my garden (green chili peppers, jalapeno's, cayenne and green bell peppers). I think you can use whatever peppers you have on hand including banana peppers. I used distilled white vinegar, but I read that apple cider vinegar could be used as well. White vinegar gives it a sharp distinct flavor and the apple cider vinegar is a bit more mellow. If you don't want to use the pepper vinegar it also makes a pretty decorative accent on your kitchen counter. Start by sterilizing your jars. The dishwasher is fine for the jars; especially if it has a sanitize cycle. Otherwise put the jars in boiling water for 10 minutes. I just put the lids and rings in a small pot of almost boiling water for 5 minutes. 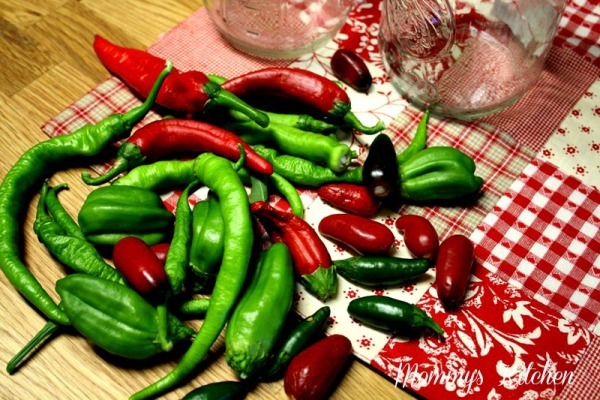 Wash the peppers by rinsing them in cold or lukewarm water. Boil the distilled white vinegar or apple cider vinegar. Add the salt and mix to combine and and turn off heat. 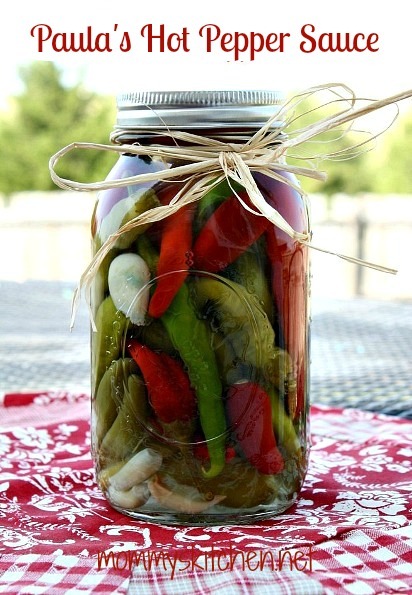 (The amount of vinegar will depend on how many jars of peppers you have). Pack a variety of clean peppers into each jar and add the garlic cloves (2 for half pints, 4 for pints and 6 for quart size jars). Make sure the peppers are completely covered with the vinegar. Fill the jars, leaving 1/2-inch of head space. Wipe the rim of the jars with a clean cloth. Add the lids and rings and screw on tightly. Not overly tight just snug. Fill a large canning pot with water. Add the jars and make sure they are covered with at least 1 inch of water. Bring the water to a boil and continue boiling. Keep the water boiling. Boil half pint and pint size jars for for 10 minutes. If using quart size jars boil for 20 minutes. Lift the jars out of the water and let them cool on a wooden cutting board or a towel. Once the jars are cool check to see if the lids have sealed. I used mason jars, but any decorative jar that has a lid that will seal will work. Properly canned jars have a shelf life of about 12 months. Cook's Note: If the garlic takes on a blue hue after canning don't worry that will happen. It will eventually go away. I have read if you use canning salt this won't happen, but I haven't tried it yet. Let the vinegar sit for at least 2 weeks before opening. 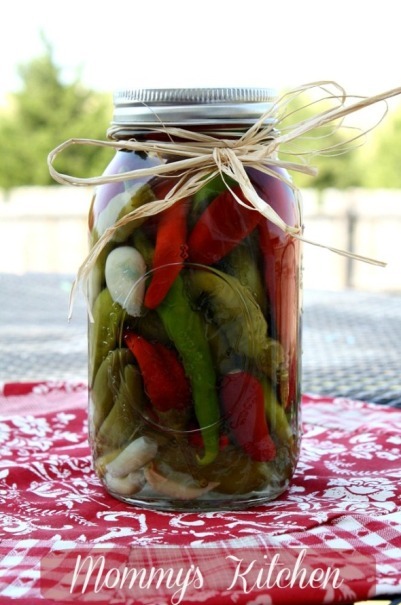 The vinegar keeps the peppers plump and preserves their shape and color. You are so clever to use up those everbearing peppers in this recipe. The colors in the jar are fabulous to look at...I'm sure the recipients will be very happy. NICE Tina! Where can I find the jalapeno jam? I don't have a recipe on my site for jalapeno jelly yet. Sorry, I just mentioned in the post that's what I wanted to make but didn't have enough jalapeno peppers. Ist there a risk of botulism from raw garlic in vinegar? Or, is it only garlic in oil? Garlic in oil is a botulism issue. It says to use salt! What kind of salt and how much? I really need this recipe for all my peppers!!! It is stated on the recipe: generous pinch of salt, and it is regular salt. I do believe the first pic you posted is actually a Tabasco pepper, as opposed to cayenne.